In spite of the accelerating popularity of the new aircraft generation aircraft among airlines worldwide, the ‘classical’ Airbus A320 and Boeing 737 still remain in firm positions across many regions. With approx. 6000 deliveries expected in the near future, the global and regional parts’ demand will be largely concentrated in the ‘classical’ aircraft sector. Currently the European manufacturer has almost a backlog of 2800 Airbus A320 with Boeing to maintain approx. the same figures for its 737 type of aircraft. But a thorough study unveils that future deliveries will be distributed unevenly around the world. Whilst the North American and the European air companies maintain their dedication to Boeing B737 with more than 1500 of aircraft to be delivered, the Asia/Asia-Pacific region awaits for less than 900 B737s. The overall number of Airbus A320 orders from the Western carriers exceeds the one placed by the Asian-Pacific-based carriers by almost 25%. 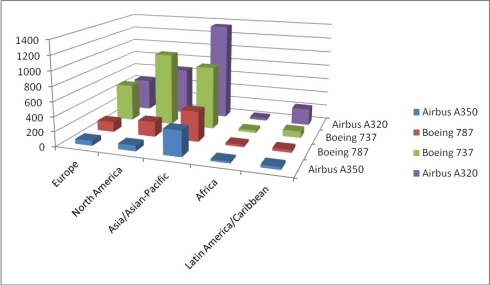 But the latter, on the other hand, shows much greater interest in the new Boeing 787 and Airbus A350 than the former. However, even though the new generation aircraft are declared to have higher fuel efficiency, they are still unlikely to overtake the Airbus A320 and Boeing 737in the middle-term perspective. The MRO industry will naturally follow the recent aircraft business trends. Spare parts for the ‘classical’ aircraft will have the highest demand as long as these aircraft types keep operating. This is preconditioned not only by the quantity of the exploited aircraft, but also by the fact that the new generation aircraft are to require less technical attention than the current generation. The OEMs will maintain their role as the prime source of the aircraft spare parts. But the alternative solution providers (including PMA companies and surplus spares) are playing an increasingly important role every year with approx. $6 billion market share, according to AeroStrategy. Naturally, the alternative parts supply industry is under rapid development, since Airbus A320 and Boeing 737 have been occupying the leading position in the narrow body market for a considerable period of time. Moreover, used spare parts are more affordable for the increasing number of the low-cost carriers’ fleets. But there is no precise statistics concerning the spare parts demand. Since different airlines operate in diverse regions and destinations, their Airbus A320s and Boeing 737s are subject to distinct operating and weather conditions. ‘The demand for certain parts fluctuates due to seasonal changes. For instance, Video/Audio electronics or even oven systems suffer from much more intense usage during the summer or major holiday seasons. The demand for such parts and systems as air conditioning or landing gear shifts individually from carrier to carrier, depending on the landing strip quality in the airport of destination and the temperature level (and its amplitude) throughout the route map. Hence in order to maintain fleet airworthiness, air companies must keep a wide range of spare parts in their stocks. But even for an airline with a monotype fleet it is a financial burden to launch and manage a large component stock on its own. That is why many airlines outsource the spare parts stocking services to independent companies, which are capable of securing prompt availability of any aircraft component,’ commented the Head of Business Development at FL Technics Spare Parts Paulius Kavaliauskas. With the head office, main technical facilities and its own stock based in Vilnius, as well as with stocks in Poland and Russia, FL Technics Spare Parts provides a wide range of spare parts solutions which cover sales, exchange and loans, consignment, PBH programs, component pool access, logistics, 24/7 AOG support, etc. The company offers technical support for aircraft spare parts, including aircraft and engine components as well as wheels & brakes, auxiliary power units (APUs), landing gear, in-flight entertainment systems (IFEs) and thrust reversers, structure elements and other parts.